With gas prices where they are, the Civic is most likely seeing an increase in demand. Here's some spy shots of the newest Civic. Call me crazy, but I'm not impressed. 2. A permalink to the story you want submitted and any background information to the story. This will make my write-up much easier. Since Monday is July 4th, I will post the Carnival on Tuesday. Otherwise, I think it would be a big waste of time. I would appreciate it if ALL PERSONAL FINANCE BLOGGERS WOULD MENTION THE CARNIVAL. That way we can build a brand. Here is the schedule of the Carnival. Also, you can check out Week 1 and Week 2. "In a bubble, hype becomes truth, and hard facts that don't fit the new paradigm are discarded as 'irrelevant.'" If you have never read any of Professor Siegel's books, you owe it to yourself to do so. I would start out with the book listed above. It is written in a very easy-to-understand way. In fact, you might even call it a page-turner (at least I would!). I started this book a couple of months ago. Unfortunately, I have this bad habit of reading more than one book at a time, which means it takes me a long time to finish a book. Anyway, I'm almost finished with this book and plan on doing a full review. This is easily going to be one of the best investment books of 2005. Looks pretty good, doesn't it? Well, don't count on it staying that high for long. The closer you get to a full year, the smaller that number will be (unless you are one genius of a stock picker!) You can play around with the numbers to see what I mean. Now I'm open to any questions and comments you might have. Like I said in earilier posts (here and here), this is big news. Here's another article (I don't know how long this link will be good for since it is a NYT article) I found on through the Drudge Report on the Cnooc situation. Personally, I hope this deal doesn't happen. Which is Better: 15 or 30-Year Mortgages? That's it for now. I'll try to finish up this list later today. There's a really sad story($) in today's Wall Street Journal about how companies reduce or eliminate pensions for their current and retired employees. I just want to say that I think the practice is disgusting. It's one thing to change benefits for someone in the 20s and 30s. It's quite another to send a retiree a letter saying "...oh, by the way, if you don't die before February 3, you will lose your death benefit." We all know by now that many companies bit off more than they could chew when they promised benefits years ago. But promising something and then taking it away is much like a company buying something from a supplier and then not paying. How long do you think that company would last? So, what's a person to do? First off, I wouldn't count on anything that has to do with a pension. If you are not putting money away in your 401(k) because you have a pension, you are TAKING A VERY BIG RISK! Start saving money on your own right now! Open a Roth IRA and max it out if you can. Then, once you retire, you are under no obligation to use the Roth. You can just let it sit there and accumulate tax-free. If you have a named beneficiary, you could possibly pass on tax-free income to them should something happen to you. Secondly, buy your own life insurance if you need it and can afford it. Don't count on life insurance from your pension. If you get it, great, but you don't want to take a chance of leaving your spouse with nothing. Ideally, you should be building wealth so that life insurance isn't necessary. Thirdly, when you retire, don't leave all your assets in company stock. Diversify! You should never have all your money in company stock to begin with, but you REALLY shouldn't have it all there when you retire. The WSJ article I referenced to had a story about a guy who worked for AT&T and retired with $250,000 in company stock only to see it drop to $20,000! Don't let that happen to you! I welcome any comments and suggestions from my readers. If you have something worth saying, please say it. Okay, now this I can't figure out. All the sudden several of my posts are not showing up. I can still see them in my posts list, but I don't see them when I republish my blog. So,... I'm going to refresh each of the posts and give them new dates. It will look like a published a whole bunch today. Stupid software! 1. Discover your comparative advantage. 2. Be entrepreneurial. In a market economy, people get ahead by helping others and discovering better ways of doing things. 3. Spend less than you earn. Begin a regula savings program now. 4. Don't finance anything for longer than its useful life. 5. Two ways to get more our ot your money: Avoid credit=card debt and consider purchasing used items. 7. Put the power of compound interest to work for you. 9. Indexed equity funds can help you beat the experts without taking excessive risk. 10. Invest in stock for long-run objectives; as the need for money approaches, increase the proportion of bonds. 11. Beware of investment schemes promising high returns with little or no risk. 12. Teach your children how to earn money and spend it wisely. How can we get Americans to save? I pose this question because the root of a lot of our problems is the fact that we, as Americans, are not saving enough money. It is really a shame that we have to come up with ideas on how to inspire people to save. But, that's how it is. 1. Start a massive advertising campaign about the benefits of saving. Kind of like they did with the savings bonds campaigns during war time. 2. Set up tax-free savings accounts. No, I'm not talking about IRAs. I'm talking about a standard savings account that is tax free. I really have no idea how it would work. I'm just trying to throw out some ideas. 3. Give tax credits for saving. 4. Give additional interest for specific savings accounts. Personally, I think the only feasible solution is the first one. I'm curious as to what my readers think. The other day I posted about how foreign investors buying up our 10-year treasury notes is causing mortgage rates to stay low. We all know that when mortage rates are low, more people will want to buy houses, which increasing the demand, which raises prices. Someone commented with a link a to this article in The Economist that I think is a must-read. Thanks, Ilya for posting the comment. Also, in case you haven't heard about this blog yet, check out TheHousingBubble2. Ben has been doing a nice job of posting articles and links regarding the housing market. Just don't stay too long or you'll get depressed. If you are a new reader of AllThingsFinancial, you may not be aware that I have another blog called Man on a Mission that is dedicated to collecting mission statements from different companies, charities, and individuals. The goal (or mission) is to have one place where people can go to study mission statements. Man on a Mission was mentioned on the Fast Company blog. The mention came about because I posted a comment regarding this post. Anyway, I wasn't expecting the generous mention. Thanks Heath! Should Planners Mix Religion and Money? Have you heard of Thrivent Financial for Lutherans? As you can tell from their name, they are a financial services company for Lutherans. That's their sole business. There's something about them that bugs me. I think it is the fact that they are mixing money and religion. And, the fact that they are commission-based sales people also bothers me. Back in 2002, Investment Advisor magazine had a cover story called "In God We Trust" that addressed this very issue. I personally think it is wrong to use your religious beliefs for financial gain. I say let your reputation speak for itself. If you do a good job for your clients, they will tell other people about you. If they happen to go to your church, fine. In fact, they may even tell other people that you are a "good Christian" planner or whatever. I don't have a problem with that. However, I think it would be wrong for me to put "...a Christian financial planner" on my business card. Financial planning is about building trust. Using your religious beliefs to build trust is wrong in my eyes. A lot of my readers are parents. So, I thought it would be cool to come up with a reference list of what I think are some pretty good financial websites for kids. Bank Jr. by Zions Bank has a pretty cool resource for parents that shows how to use their website. Children's Financial Network by Neale Godfrey is also pretty impressive. Have your kids take this Money Quiz to find out whether they are a saver or spender. The Unknown Professor at the FinancialRounds blog sent me a link to the Lemonade Game, that will help teach kids how to manage a business. Another pretty cool website is KidSenseOnline by John Nuveen & Co. Their quizzes link does not appear to be working. YoungBiz is all about kids and business. It's pretty cool. YoungInvestor helps teach kids about investing. Moneyopolis is a game "where money sense rules." Those are a few to get you started. I hope to add more as I come across them. If you know of any that should be included in this list, please leave a comment or send me an email. Carnival of Personal Finance #2 is Out! Today's Carnival is being hosted by Jim at Blueprint. There's some good stuff there. Go check it out! Carnival #3 will be hosted by AllThingsFinancial next Monday. If you are a personal finance blogger, please email me your contribution with "Carnival #3" in the subject line. I updated the PrudentPortolio this afternoon. The portfolio gave back most of the gains from last week. However, the portfolio is still up .63% since inception (June 13th) while the S&P Index is down .55%. Ford, which was last week's biggest gainer, was this week's biggest loser (down 9.49%). Two stocks - MBIA and Louisiana Pacific - were up this week (.05% and 3.48%, respectively). This is a good post on what it means to be "rich." John Waggoner of the USA Today has a really good article on Roth IRAs for kids who have summer jobs. The real beauty of a kid starting a Roth IRA is that they are most likely in a low tax bracket now and since they are starting so young their accounts have time to grow, chances are good that they will be in a higher tax bracket when they retire. Is Foreign Investment Responsible for the Housing Bubble? This editorial (free) in yesterday's Wall Street Journal seems to think so. What he says makes a lot of sense. The premise of his argument is that if mortgage rates are tied to the 10-year treasury, and demand for 10-year treasuries is high, then the price of the treasuries will rise and the yield will decrease (inverse relationship), thereby keeping mortgage rates low. Low mortgage rates mean cheaper financing, which means increased demand for housing, which means higher housing prices. It all makes perfect sense when you think about it, unless I'm wrong. Today's Wall Street Journal has several articles regarding Cnooc's bid for Unocal. The WSJ's editorial page is pretty much backing the deal - or at least the Cnooc's right to bid. David Jackson's China Stock Blog references an article in Barron's that says the deal probably will not go through. This is a HUGE deal, folks. The implications of this are huge. I would feel much better about the deal if Cnooc wasn't 70% owned by the Chinese government. Let's say the deal does go through. What's to stop the Chinese government from withholding the oil from the US or, simply using it in China? In the long-run, this is going to be the issue. China chat: The Levin Institute hosts a live audio conference on June 20 to address your inquiries about China. I'm curious as to what you think about this. Please feel free to leave a comment. I found Steve Pavlina's Blog via the To-Done Blog. It is a pretty cool blog that fits nicely with the AllThingsFinancial theme that we are all responsible for ourselves and that any kind of success is going to come from ourselves (and God) and no one else. Anyway, I really like his post on finding your purpose. As many of you know, I have a blog dedicated to mission statements called Man on a Mission. I have mostly concentrated on company mission statements. However, I think it would be cool if I included mission statements or creeds from all my personal finance blogger friends. I would think that personal finance bloggers would be some of the most driven people out there. So, if you have a mission statement, please send it to me at my AllThingsFinancial email address. I will include it along with a link to your blog. Yesterday I posted about whether or not rechargeable batteries are a good investment. I did a cost comparison between Energizer's AA rechargeable batteries and their standard AA battery. The hard part about doing this kind of comparison is that the two batteries don't have the same battery life. The rechargeable battery does not last as long between charges as a standard battery. Thank you for visiting Energizer's Web site and also for your inquiry. I would be happy to assist you. Combining alkaline and manganese yields 1.5 volts. Combining nickel metal hydride yields 1.2 volts. Our regular alkaline cells are 1.5 volts. Our rechargeable nickel metal hydride batteries are 1.2 volts. Since all devices operate within a voltage range, you should still be able to use the rechargeable batteries. The batteries will not last as long per charge. However, you will be able to recharge them. Rechargeable batteries do not last as long per charge as regular batteries. The advantage of rechargeable batteries is that you can recharge them hundreds of time without having to buy more. You save money in the long run, but you have to remember to recharge the batteries. Rechargeable batteries are very different from standard batteries. They are not only different in size and shape, but by capacity, voltage, chemistry, and technology as well. As you are aware, there are special guidelines to follow in order to properly use and maximize the life of your batteries. Battery life is determined based on many factors. The three most important factors are drain rate, the cutoff voltage of the device, and the temperature the battery is exposed to. Generally the manufacturer of the device should be able to give you an estimate of how long a particular battery should last in their device. Hopefully this information will assist you. If you need further assistance, please do not hesitate to contact us. It wasn't exactly the clear answer I was looking for. I guess the life depends on how you actually use the battery. Anyhow, it doesn't change the fact that after the intial upfont costs, rechargeable batteries are a good investment (especially if you have lots of kids with lots of toys!). For those interested, Energizer has a pretty good FAQ section on their website. Cnooc is 70% owned by the Chinese government. So, essentially, you have the Chinese government making a bid for a US company. ExxonMobil's CEO Raymond Lee said it would be "a big mistake" if the US were to block this deal. "You have to have free trade," Mr. Raymond said during an appearance at an energy summit sponsored by Reuters. Although I agree with him, it's easy for Mr. Raymond to say this since it isn't his company also making a bid for Unocal. I'm sure this will be an interesting story to watch. If your RSS Reader shows that AllThingsFinancial has a lot of new posts, it's because I am working out the bugs in my format. I want to offer longer summaries. Anyway, please bear with me during this process. For those who are interested, I did a midweek update of the PrudentPortfolio. The portfolio has given back some of the gains from last week but is still up 3.15% since inception compared to 1.32% for the S&P 500 Index. Last week's biggest winner, Ford, is this week's biggest loser - down 5.32% for the week. This week's biggest winner is Louisiana Pacific - up 6.37%. Are Rechargeable Batteries a Good Investment? With two boys - ages 9 and 8 - and all their toys, we go through a ton of batteries. So, I finally broke down and bought an Energizer Universal Recharger ($19.99) and a 4-pack of Energizer AA NiMH batteries ($9.99), making my upfront investment $29.98. Now, the question is: how long before I recoup my investment? I am going to assume that the rechargeable batteries last as long between charges as the regular batteries do (I have an email in to Energizer about this but have not yet heard back from them). I can get a 24-pack of regular Energizer AAs for $12.99 ($.54 per battery). The NiMH batteries can be charged 500 times, so that's like 2,000 batteries. Divide $29.98 by 2,000 and you get $.015 cost per battery over the long-term. So, although it seems like a pretty hefty upfront expense, if my math is correct, over the long-run I will save about $.525 per battery by going with the rechargeables. Oh, and to top it off, I am helping the environment! Yesterday, when I wrote the post about life insurance, I referred to a book by G. Victor Hallman and Jerry S. Rosenbloom called Personal Financial Planning . I recommend this book as a great reference book for personal financial planning. It is not a read-it-from-cover-to-cover book. But, there are some pretty good gems of advice. One of those gems is about understanding your investment objectives before you design your asset allocation strategy. Your objectives will change over time. Therefore, your investment policy should change too. Usually, retirees have this objective. They focus primarily on yeild. This is the objective of people who do not want to lose any principal. This is usually a very rigorous investment policy. This is often a retiree's objective too. It is a less-stringent form of the first objective. People with this objective want their capital to grow to meet future needs, but also desire current income now. This is the typical objective of someone during their working years. This also is typically the objective of a person during their working years. Unfortunately, it is also the objective of someone who is getting close to retirement and is trying to make up for lost time. The objective here is to invest in a way as to decrease the amount of taxes from investments. Those are the most common investor objectives. Some investors might even have more than one objective. Regardless, by knowing your objective and investing accordingly, you will most likely have greater piece of mind in your investing adventures. This is for all you data freaks. I found something that is pretty cool. For those of you with Excel, there's a spreadsheet containing data that was put together by Robert Shiller for his book Irrational Exuberance - Second Edition . You can download the spreadsheet by clicking on this link (clicking on the link will automatically start the download, which is from the IrrationalExuberance website. Once you download the spreadsheet you can play around with the numbers. It is really quite impressive! It is usually cheaper to pay all of your debt off with life insurance leaving your family with no monthly debt payments. Remember, though, to adjust your annual income needs accordingly. If there is no mortgage anymore, don't insure yourself for that monthly expense. Reduce your monthly income needs accordingly. One way people commonly end up over-insured is that they forget the cost of living will go down substantially once all debt is paid off. Also, I am an advocate of carrying the bare minimum in insurance. What I mean is to cover all bases just like you've said, but never round up or estimate. Get the numbers down cold and then do your calculations. Where you rounded to $1M, I would only buy exactly 978 units (a unit being $1,000). There are insurance companies that will sell exactly the number of units you need. Save as much as possible and invest the difference into a fund that moves you toward being self-insured. Remember, you'll need to be self-insured by the time your term-life policy runs out. Have your advisor figure out how much that will need to be (including a downward adjustment since you'll be debt free by then if the advisor is doing their job right). Over-insuring yourself seems like a good thing, even honorable. But it bears a substantial cost. Diverting that money elsewhere (debt elimination, or preferably saving to be self-insured) is a better route. In other words, focus on eliminating the burden you would place on your family. Eliminate your debt, create an emergency fund, etc., but do it now. Don't depend on insurance to do it for you. Only use insurance to the extent and for as long as absolutely necessary until the burden you leave has been essentially eliminated. Once you've achieved certain milestones, reduce your insurance accordingly and again invest the difference. For example, once you've established an emergency fund, reduce your insurance by the amount needed to create one if you had died. Once you've paid off your mortgage, reduce your insurance by the amount you had needed to cover your mortgage if you died. Your goal is financial independence. That goal is a line on a graph somewhere. Your current situation is another line somewhere below inependence. The only reason to hold insurance is to cover the gap between those two lines. Over time, your "current" line will move up as your savings increase. Your "independence" line will move down as your debt is paid off. As the gap between the two lines becomes smaller, your insurance should become smaller as well. Summary: Don't give insurance companies any more money than you absolutely have to. Invest the rest for the benefit of your heirs. What I tell my clients with kids is that they should take thier annual income and multiply it by the # of years until the youngest has left the house, typicaly age 21 (after college). Clients with spouses but no kids should have their annual income multiplied by the number of years left before the spouse reaches age 65 (retirement). Single individuals may or may not need life insurance, but it never hurts to take out a small perm policy to cover final expenses and burial costs. Single people with considerable debts -- like student loans -- would not be pleased to see their parents shouldering their bills after they're gone. If I'm dealing with a single and wealthy individual, they may go for a policy which will provide liquidity for estate planning purposes. Shletered in an irrevocable trust, that policy will reduce that client's taxable estate, hence leaving more for their heirs, like a beloved nephew for instance. If your 3 beneficiaries in life are your family, charity, and the government, I can't think of one sane person who'd choose to leave less to their family and more to the Tax Man. These ideas are not absolutes -- just rules of thumb I use everyday. One has to take special needs (handicapped children, for ex. ), tax implications, and the future of pensions and social security into account. Not to mention, the soaring costs of a decent college education. A life insurance policy will send junior to college even if a 529's funding is never completed. Ultimately, life insurance is used to replace lost income. And that's what those seeking it should focus on. Thanks for your excellent comments, guys. A place to exchange ideas was what I had in mind when I started AllThingsFinancial. Should I offer my full feed or partial feed? I switched to partial feed a couple of weeks ago because I was tired of finding my full content on other blogs. I'm honored that they like my content enough to post it. However, it irritates me that they post all my content and make it hard for readers to even know that it came from me. So, I changed my settings so that only partial feeds are available. I got an email from a guy asking me to switch back to full feeds. I told him why I switched and he emailed me back saying that it was a weak excuse and that if people want to copy my content they can regardless of my feed selection. Although, that's true, it does make it more difficult for them to do so. Anyway, I'm curious as to what other personal finance bloggers are doing. This is a long post. I couldn't think of a good way to break it up. You see commercials all the time about how you can get $100,000 of term life insurance for $10.00 (or whatever amount it is) per month. Although that sounds good, the real question is: how much life insurance do you need? I'm going to try to address this question with this post. It's never fun to talk about life insurance. However, it is a necessary ingredient in a prudent financial plan. There are various methods for calculating insurance needs. I'm going to discuss a more in-depth method of estimating for earnings replacement and cash needs. I found this method in a book called Personal Financial Planning by G. Victor Hallman and Jerry S. Rosenbloom. There are many life insurance agents with computer programs who can run these numbers for you. However, it is always good to know how to compute the numbers for yourself so you know that the agent isn't trying to sell you more insurance than you need. Find your annual gross earnings for you and your spouse. You will want to do this computation for each of you. Taking each person separately when both are working outside the home, estimate what percentage of gross earnings should be continued to survivors if the person were to die. According to the authors, this is usually around 70-80% because some expenses will be reduced upon death, while others like childcare will most likely increase. Subtract the existing sources of income found in Step 3 from the gross income desired. This will give you the deficit in the amount of annual income desired. Convert the deficit found in Step 4 into a lump-sum amount of capital needed to meet the annual income desired. The method for arriving at this number varies from advisor to advisor. Some feel that the insurance only needs to provide for the surviving spouse until the last child is through college. Others believe it should last throughout the survivor's lifetime. Still others believe it should provide for grandchildren. Notice that each example means drastically different insurance needs. This is an individual decision and one that should not be taken lightly. If you do meet with an insurance agent, remember that they get paid based on HOW MUCH insurance you buy. Buy what you are comfortable with and what your budget can afford. Say you find out that you need $50,000 per year in additional income provided to your spouse. Your spouse is 35 years old and you want to provide them with this income for their lifetime with any remainder going to your kids. To fnd out how much capital this would require you have to know the amount needed ($50,000), the expected return on the portfolio (3.5%, which is the expected inflation rate). Now, you simply divide $50,000 by .035 to get $1,428,571 ($50,000/.035 = $1,428,571). As long as the surviving spouse invests the insurance proceeds safely and never uses principal by spending more than the interest earned on the portfolio, the money should never run out. Consider any cash needs at death. These include things like burial costs and any hospital bills, the establishment of an emergency fund and possibly paying off any debts. For this example we will say they need $250,000 in cash. Combine the lump sum earnings replacement need found in Step 5 with the cash needs found in Step 6 and subtract the person's other assets and present life insurance coverage from the total need for coverage to determine the amount of new life insurance (if any) the person needs. We will say that they currently have $500,000 in insurance through their employer and they have $200,000 in their retirement plans. So, based on this very simple example, this couple needs approximately $1,000,000 in additional life insurance. At least by running the numbers yourself, you will give yourself some idea of what to expect when you go see your insurance agent or go shopping online. Terri Cullen, author of the Fiscally Fit column of the Wall Street Journal, has written a useful article (free) with helpful tips on finding the time to manage your finances. There's no doubt that managing your finances can take up a big chunk of your time, especially if you are a do-it-yourselfer. Some things I have done to make things easier for me is put all my finances in one drawer in my desk. All aspects of our finances are right next to me, easily accessable. I also have one place where all the incoming mail is gathered. I try to go through the mail daily and any bills I find go into a "Bill Due" folder. Then, I sit down twice a month and pay bills. I use Wells Fargo's Bill Pay (which recently did a site redesign that makes it much easier to use now) to schedule payments that are a week or two away. That's pretty much what I do. I would be interested to hear from my readers as to what they do that might be helpful to the rest of us. Please share. Steven Podnos has written an interesting article in the June issue of Investment Advisor magazine about how parents can use income shifting strategies to pay for college expenses. The whole idea behind inomce shifting is that almost all children have a lower tax bracket than their parents. Therefore, it makes sense to try to shift income from the parent's bracket to the kid's bracket. A student’s college expenses are $20,000 per year. In this case, the parents would need to earn more than $30,000 (assuming a 35% tax bracket) to pay the educational costs out of ongoing earned income. Alternatively, they may elect to sell an investment with a $20,000 long-term capital gain and contribute $5,000 of earned income. They would be left with a $17,000 gain on the sale after a 15% capital gains tax, and $3,200 of their income after ordinary income tax. So the parents would be left with $20,200 for educational costs after a $4,800 tax bill. If instead, the parent paid the child the same $5,000 of wages and also gifted the appreciated asset to be sold in the child’s tax bracket, the tax would be essentially zero on the wages (standard deduction of $4,850) and only $1,000 on the capital gain in the child’s lower tax bracket. So by having your clients use income shifting, you have saved them almost $3,700 in one year. A student’s college expenses are $30,000 per year. The parents may earn $45,000 to cover the $30,000 cost while also facing income taxes of $15,000, or they may sell an asset worth $20,000 that has appreciated in a 15% long-term capital gain bracket. As in the first example, with a $20,000 capital gain there would be $3,000 due in taxes. To pay the remaining $13,000 in educational costs would require earning approximately $20,000. The family would accumulate $30,000 for their child’s education that year, but with a tax cost of $10,000. But what if they paid the child $20,000 in wages for work such as a consultant or proofreader during the summer and on some school breaks, and gifted the appreciated asset to be sold in the child’s tax bracket? In that case, tax would be approximately $1,500 based on an adjusted gross income of $12,000, after the student uses the personal exemption of $3,100 and standard deduction of $4,850. The rationale for this action is discussed in the article. Since the child is not a dependent, he may then use a Hope or Lifetime Learning Credit to wipe out most of the $2,500 in tax liability for the student ($1,000 capital gains and $1,500 tax on earned income after deductions). By using income shifting, you have saved your client between $7,500 and $10,250 in one year. It's an interesting article that's well worth reading. Okay, you're going to see the mean side of me. 1. They ask to speak with someone so I'll be real cheery and say "sure you can speak with them. Hold on a second." I'll put the phone down and just leave it there for several minutes. Eventually they hang up. 2. I'll answer the phone and just keep saying "hello" over and over again. 3. I'll let them do their spill and then hang up. Of course I'm working while they're talking. 4. Sometimes I just give the phone to my one-year old daughter. Those are a few of things I do. Yeah, I know it's mean. But, that doesn't mean it isn't fun! This week's Barrons has a really good article ($) on valuing Google (GOOG). Although the article doesn't come right out and explicitly say that Google is overvalued, it does say that the upside potential has diminished somewhat. The article also references a really good valuation piece written by John Hussman of Hussman Funds. I highly recommend you read his piece, particularly the opening paragraph. I just posted the objective of the Prudent Portfolio and other important information regarding the porfolio. For those who are following the portfolio, you'll want to read the post. I first heard about You Need a Budget in a review I read on the Frugal for Life blog. I thought I'd do my own quick review. I hope to add to this review as I get more acquainted with the program. If you are an Microsoft Excel user and are in need of a personal budgeting system, you might want to check out You Need a Budget (YNAB), which really gives you a lot for the price. I have been reviewing the software for the last couple of days. It's a pretty good substitute for both Money and Quicken, especially when you factor in the $19.99 price. When you first download the software and open it up, it can be a little intimidating. But, all you have to do is click on the "Setup" tab and it is pretty much straight-forward from there. The software has a lot of neatly-organized categories and you can easily add categories if necessary (just follow the instructions on the page). That's all I have time for now. For those who are interested, you can check out YNAB. I hope all you fathers out there had a nice Father's Day. I had a really nice day. I spent the day with my family. We went out to lunch and then got some ice cream later in the afternoon. I got some new shirts and a business card case, which I needed really badly. I was tired of pulling out dog-eared business cards to hand to people. I never liked the idea of the impression that left on people. Now I can pull out my snazzy (is that a word?) business card case and hand people a nice, crisp business card. The Carnival of Personal Finance is Out! You can check it out at ConsumerismCommentary. This is the personal finance blogger's answer to all the other carnivals going around! The Prudent Portfolio got off to a great start this week. You can read about it on the PrudentPortfolio blog. I hope to add in some extra tidbits over the weekend. BTW, somebody needs to come up with a software program that will convert Excel Spreadsheets into nice, neat tables that can be copied and pasted into blog posts. This table stuff is killing me! Yesterday I compared 15, 30 and 40-year mortgages. Today I wanted to look at some numbers regarding interest-only (I/O)mortgages. Yesterday's Wall Street Journal had an article about I/Os. I put a table together using the numbers laid out in the article. Based on this example, this person would pay nearly $29,000 more in interest using the I/O loan than they would had they used a traditional 30-year fixed loan. I/O loans should ONLY be considered by those who can afford the payment after the I/O period. Unfortunately, I don't think that's the case with most of the people using I/O mortgages. Karen Damato of the Wall Street Journal has written an article (free) that everyone should read that goes along with what I have been saying for a long time: you have to know the motivations of your financial advisor/planner. You also have to look out for conflicts of interest. One of the main areas of concern is the fact that a lot of financial planners and accountants have teamed up with broker-dealers. The broker-dealers have formed agreements with certain mutual fund families. The broker-dealers then urge their financial planners to use those mutual fund companies that they have relationships with by paying the financial planner a greater percentage of the commissions from those sales. Unfortunately, clients are rarely made aware of these arrangements. 1. Do you work or have a relationship with a broker-dealer? 2. Do you receive incentives or are incouraged to sell one mutual fund family over another? 4. Ask to see Part II of the ADV, which is available to all who ask. Those are a few pointers. A good planner will have no problem answering those questions. Steve Mertz has a blog called In Cash Flow We Trust that is worth checking out. I would categorize his blog as inspirational and financial. I like this post. I'll add him to my sidebar in the near future. I just finished updating the Prudent Portfolio to reflect today's closing prices. I have to admit, it's a lot easier to update it when the market is up. So far the Prudent Portfolio has had a good inaugural week: up 2.98% while the S&P 500 Index is up 1.07%. I'm sure I won't be able to keep updating this every day. They aren't new. They have been around since the 80s but died out until now. I'm talking about 40-year mortgages. With the price of housing increasing so fast, lenders are now offering longer-term mortgages so that people can afford to buy houses. Of course, these longer-term mortgages come with a price. As the table below shows, the longer you stretch out the term of the loan, the more interest you pay. The person who uses the 40-year option in this example pays over $100,000 more in interest over the course of the loan than the person with the 15-year mortgage. This isn't necessarily bad. With a low enough interest rate, one can argue that it might be wise to stretch out repayment of the mortgage as long as possible and put the difference to work in a Roth IRA. There is certainly some merit to this strategy. However, it is important that if you go this route, that you actually follow-through otherwise, you'd do much better with the 15-year mortgage. The Prudent Portfolio closed yesterday at $101,981. A 1.98% return in three days is pretty good. 1. Safely Spend Your Savings. Most experts recommend you can safely spend 4% to 5% of your portfolio in your first years of retirement. 2. Build a Bond Ladder for Steady Income. This time-tested strategy helps smooth your income regardless of what happens to interest rates. 3. Dividend-Paying Stocks Can Pay Off... In Dividends. Rising dividends can help you keep up with inflation and help cushion market downturns. 4. Find a Good Parking Place for Your Cash. Check out Kiplinger.com for profitable ideas. Earn higher yields on money-markets, CDs, and savings accounts. 5. Get Unbiased Help From a Financial Planner. Pick a financial planner who doesn't accept commissions from the products they sell. 6. Get a Better Deal When You Buy Municipal Bonds. Check on the latest prices and yields at Investing in Bonds to make sure you're getting a good deal. 7. Review Your Designated Beneficiaries. Have you got the right designated beneficiaries on your IRAs, 401(k)s and other retirement-saving plans? You may find that the names are out of date. 8. Determine Whether to Postpone Your First IRA Distribution. You can hold off taking the first required distribution from your IRA but you'll have to take two withdrawals in the following year. This can bump you into a highter tax bracket. 9. Make the Most of Your IRA and 401(k). In 2005, the amount you can squirrel away each year into an IRA and 401(k) increases to $4,000 and $14,000, respectively. If you're age 50 or over, you can put away an extra $500 into your IRA and $4,000 into your 401(k). 10. Protect Your Savings With Long-Term Care Insurance. With health-care and nursing-home cost continuing to increase, consider buying long-term-care insurance to protect you from some of those expenses. "Growth managers typically seek out companies whose earnings are increasing at a faster rate than the market as a whole, and are therefore worth the higher price they usually command. Value managers tend to look for dependable businesses that are, well, undervalued according to fundamental measures, such as low price/earnings ratio. Many simply let index creators such as the Russell Investment Group determinde which stock fall into each category, and then they pick stocks from that group." I'm still working on the layout of PrudentPortfolio. I used one of Bloggers standard layouts and changed it up for my needs. I needed a wider column for my tables. Anyway, the site is at least up. I will update the portfolio on Friday afternoon or Saturday morning. Surely there is a way to program a table to update itself. Does anybody know anything about this? I don't even know where to begin to learn about this. If anyone knows, please leave a comment or email me at AllThingsFinancial at Hotmail.com. There is a very good editorial (free as long as you furnish your name and email address) in today's Wall Street Journal that I think EVERYONE should read. It is about the Spitzer v. Grasso trial and the 1,000 pages of interviews that were done (but left out of) for the publication of the Webb Report, which Spitzer is using to base his case on. I've made it clear in past posts that I am not a fan of Spitzer's. Although, I think he did a commendable job taking on mutual funds and their practices, I think power has gone to his head and I think he thinks he is now above the law. I wouldn't be as tough on Spitzer if his actions didn't seem so partisan. I bought an HP OfficeJet 7410 All-in-One a couple of months ago. I love it. What I don't love is the price of ink! It's ridiculous how much they charge for ink! The 7410 takes two cartridges: No. 96 and No. 97. By the time you add in sales tax for the two cartridges, it comes to over $70. That's roughly 15% of the price I paid for the machine! Unfortunately, my town is small enough that we don't have a Cartridge World or someplace that can refill cartridges. Besides, from what I have read the quality of refills just isn't as good as new cartridges. I tried refilling them myself once but found it to be a messy waste of time. Anyway, have any of you had any success in finding cheaper ink jet alternatives? Please comment and let the rest of us know. The first one: I bought a two-pack of Scotch Super Glue Gel made by 3M. When I went to super glue my flip flop (yes, I'm so cheap that I glue my flip flops together! ), I opened the tube and found out it had nothing in it! So, I opened the second tube. It had something in it, but it was such a small amount that it wasn't enough to do the job correctly. So, I got on the internet, found the 3M website, and wrote an email to the company explaining the situation. A couple of hours later, I got an email back from the company telling me that they would make it right. I forgot about it until today when I got a box from 3M containing two tubes of Super Glue and some coupons for some of their other products. The second one: I didn't actually complain in this instance, but it is a good story of how customer service SHOULD BE DONE! I had to take the kids with me today to run some errands. It was hot so we stopped at the local Cold Stone Creamery that opened just this past weekend. We all placed our orders and when it came time to pay, I pulled out my debit card. The cashier took it to their machine and was gone for a really long time. She came back and told me that the machine was down and asked if I had any cash. Of course, I didn't have any cash, that's why I was paying with my debit card. Anyway, she told me that they were having trouble with the machine and asked me if I could wait, which was fine with me since I wasn't about to let the kids back into the car with ice cream cones. Anyway, a few minutes later she told me that she was sorry about the wait and she didn't charge me for one of the cones since I had to wait. Now that I think about it, I should have remembered her name so that I could call her manager and tell him what a great employee he has. Oh well, I get her name next time when we go back! The Prudent Portfolio is set. You can check it out by going to PrudentPortfolio.com. Please keep in mind that PrudentPortfolio.com is a work in progress. I'm still very new at making tables. I'm also trying to make the table useful and not confusing - which can be a real challenge. The federal deficit dropped to $35.29 billion from $62.46 billion a year ago. The Whitehouse also expects the federal deficit to be in the $350 billion range by January, which is a pretty big downward adjustment from the $427 billion that they had projected earlier this year. Now if we could just get the government to stop spending so much money! I finally got around to adding some new blog links to my sidebar, which are marked with an *. Please check them out and tell them JLP at AllThingsFinancial sent you. As always, all links to AllThingsFinancial are welcome and appreciated! Hello everyone! I have been working on another new blog called Prudent Portfolio, which will track a portfolio of value stocks that I have selected using various criteria. This is something I haven't done before but I am very excited about it. I think it will be a lot of fun tracking a portfolio that all my readers can see. If you want to learn more about the project, check out PrudentPortfolio. As a blogger, there are certain tools that are make blogging so much easier. One of those tools is Technorati. I love this website. I use it to keep track of who is linking to AllThingsFinancial. You can see for yourself by clicking here. I'll post more on this later. Right now I have an eye doctor's appointment to get to. I bought Michael Gerber's newest book E-Myth Mastery a while back. In case you aren't familiar with his work, you might want to check out the E-Myth Mastery website. Michael has been talking about small businesses since 1976. He has some really good ideas. Some of which I'll share with you in another post. I have been working to make Man on a Mission easier to use by organizing the mission statements in alphabetical order. So far, these are the companies that I have organized. There are still other's but they are not in this list. I hope to have part VI of my "Getting Organized" series posted later today. I received an email from iShares today. The 12 iShares that they are splitting will start trading at their split prices today. They also sent me a link to a helpful FAQ page that you may want to check out. For those of you with kids, you may want to check out AllowanceMagic. David has put together a booklet about allowances that is written on their level. You can order it at his website for $8.95. It's a neat little book and may be helpful in teaching your kids financial responsibility. There's a pretty cool blog I found a couple of weeks ago called TheSuccessRulebook. He has some excellent posts on getting things done and success in general. Finally, I got my signed copy of David Allen's Getting Things Done (GTD) yesterday. I read about this book through 43Folders and To-Done!, two blogs I wrote about in this post. 43Folders has a really nice tutorial of GTD that you can read here. One thing I thought was kind of funny in the book is that he knocks Stephen Covey's methods without actually saying Covey's name. I kind of thought that GTD would be an addition to Covey's methods, not competition. Anyway, you'll have to see for yourself. I hope to post updates as I work my way through the book. I got my July issue of Kiplinger's magazine today. On page 20 there's a interview with Michaeel of PFBlog fame. There's no link to the Kiplinger site yet. I'll post one when I can. Congrats Michael! Thanks for helping to make personal finance blogs more popular. Are Americans Ready for Retirement? A special thanks to Kaja Whitehouse at Dow Jones for showing me where to find this information. Fidelity just released the findings of a study about Americans readiness for retirement. The findings aren't encouraging. According to the study, which you can read by clicking on the above link, the median replacement rate if nearly 60% of workers' income. The word "median" means that half of the workers surveyed fell below 60% and half were above 60%. At the 60% level, a worker who makes $100,000 now can count on $60,000 when they retire. The uncomfortable part about this 60% number is that it includes pension money as well as Social Security, neither of which is a sure bet to be around in its current form. The bottom line from all this: workers simply aren't saving enough for retirement. 1. More pension plans, endownments and charities have shifted into hedge funds. 2. More investors today meet the wealth requirement of $1,000,000 in net worth - which is about to be raised to $1.5 million in the near future. 3. There are an extimated 8,000 hedge funds that manage $1 trillion in assets. 4. The growth of hedge funds and the fact that they often use borrowed money when taking positions means that they are now playing a much bigger role in the day-to-day price movements of stocks. 3. details on trading strategies and how they value their portfolios. As of right now, only 35% of hedge fund managers are registered with the SEC. 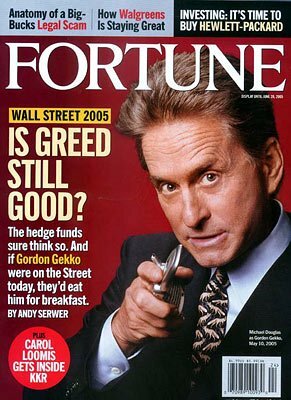 While we are talking about hedge funds, the latest issue of Fortune has a cover story on hedge funds. The June 13 issue of Fortune has a cover story on hedge funds as well as a look back on the greedy 80s. Interesting issue. There's a article on the Wall Street Journal's free site that is talking about how mutual fund managers are moving into growth stock investing and moving away from value. The subtitle of the article says "Finding Bargains,..." In my mind, finding a bargain is the same thing as finding value, which is the same as "value investing." Maybe I'm being nitpicky here. Anyway, it's a good article so check it out. I think it is important to have an asset allocation that is comfortable to you. Once you have the asset allocation in place, stick with it. Don't worry about growth or value. Simply stick with your chosen allocation and don't worry about all the fluff.